The exercise contained in this card can be done anywhere that people congregate. The object of the exercise is to increase the amount of compassion in the world. 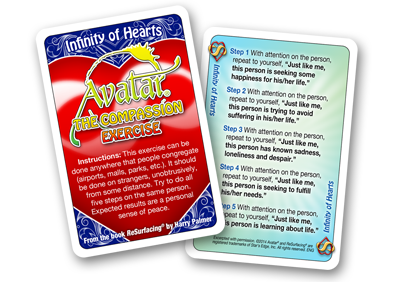 The Compassion card is sold in packs of 50 cards. "The thing we have to solve is how to make care and compassion more valuable than self-importance and impermanent things. The ultimate solution is broadly awakening the enlightened mind of spiritual consciousness. We need another miracle moment in which everyone realizes that we’re in this all together, and that the earth is the only spaceship that we get. Star’s Edge has laid the foundation. Future generations need to direct their greatest efforts toward coming together; the world needs less superpowers and more friendly tribes. You can play a major role in this transformation. The solution that we’ve been looking for is more alignment and cooperation, more attention on service to others. We need to become citizens for the planet. Have you ever felt the warmth of the morning sun on your face? That’s what the broadcast from infinite being feels like, it inspires goodness, and love, and compassion. And it brings tears to the eyes, and compassion to the heart. Let's increase the amount of compassion on the planet..."
Arabic, Catalan, Chinese-Simplified, Chinese-Traditional, Czech, Dutch, English, Farsi, French, German, Hebrew, Hungarian, Icelandic, Indonesian, Italian, Japanese, Korean, Macedonian, Norwegian, Polish, Portuguese, Romanian, Serbian, Slovenian, Spanish, Swedish, and Turkish.